Donkey Shed Cottage. Grade II listed building in Bridgnorth. Character cottage in Bridgnorth overlooking the River Severn. 1 bedroom cottage in Bridgnorth Shropshire.Lounge with inglenook fire place and sofa bed if required.Kitchen with fridge freezer,gas cooker & washing machine.Entrance to small garden & donkey shed with views of the River Severn & Severn Bridge. Bathroom with shower,w & hairdryer. Bedroom with double bed,wardrobes & River views c/h throughout. Donkey shed cottage is just a minute walk to the Bridgnorth High St where you will find a good selection of independent shops,resturants,pubs,tea shops,antique shops and a Saturday street market. Visitor attractions include Severn Valley Steam Railway,Castle gardens & Venicular Railway.Voted best large market town in the UK 2016. Just a 15 minute drive to the famous Ironbridge a Unesco World Heritage Site & Ironbridge Gorge. Ludlow 30 minute drive,45 minute drive to Shrewsbury the county town of Shropshire.60 minute drive to the Welsh border. 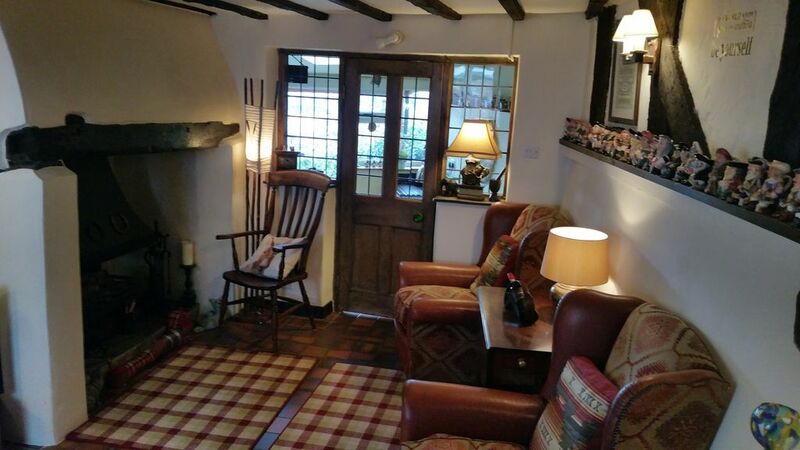 The cottage dates back to the 18 century and has a original staircase steep & narrow. Married couple mid 50s.Enjoy walking,good food,wine & craft beer,yoga & music. Donkey Shed Cottage was occupied in the nineteenth century by the last man to work pack donkeys between the High Town and Low Town. Ideal property just off the High Street for single person or couple to explore the delights of Shropshire.Bridgnorth itself has plenty to offer with beautiful surrounding areas. Few towns have so much to offer for anyone interested in history. Severn valley steam railway 11 miles of beautiful scenery along the Severn Valley to Kiderminster.Venicular Cliff Railway,River Severn for fishing and the base for Bridgnorth rowing club.Remains of the Norman Castle Keep,Castle Gardens & Castle Walk with great views of the River Severn.All within a few minutes walk from Donkey Shed Cottage. Permit provided to park in residents parking area. Bath & hand towels provided. . Welcome pack of Bread,milk,tea,coffee,sugar & Orange juice. End of garden terrace with river views. Bridgnorth golf club 1 mile several golf courses within 20 minute drive. Steps lead down into the property. We stayed at Donkey Shed Cottage for a week in October 2018 and really enjoyed our stay. Bryan was at the cottage when we arrived and showed us everything we would need and also where we could park,which was just at the end of the Cartway (parking permits are needed but Bryan had sorted this for us).The cottage itself was very clean,cosy & warm and with it’s little garden it had everything we needed for 2 adults & doggy. Bridgnorth is a lovely market town and Donkey Shed Cottage is very central making it easy to walk to most places. Such a cute little cottage with all the comforts of home. Bryan was very adaptable when our plans for arrival changed at the last moment and made us feel welcome when we arrived. Location was perfect with easy parking available. Donkey Shed is just a short 1 minute walk down from the High Street with wonderful views towards Low Town and the river from the back of the cottage. Although Cartway was very busy with late nighters on the Friday and Saturday night/early morning, a peaceful night's sleep was no problem because the bedroom was at the back of the cottage with a very comfortable bed! The kitchen was well equipped for the prep of simple meals and the lounge was a wonderful place to sit and enjoy the log burner with an array of lighting choices. Do not miss the amazing lantern light by the fire! I want one! The stairs were very steep and perhaps not for those with mobility issues. Donkey Shed was a wonderful find. We loved our stay . Thank you for looking after🛠 and the kind words about Donkey Shed Cottage.We're glad you enjoyed your stay and hopefully see you again if ever your in the Shropshire area. We spent 3 nights in this delightful cottage. It had everything we needed, with lovely views over Bridgnorth. All was clean & we were made to feel most welcome. We were only a 10 minute walk from the Severn valley railway, which was perfect for us. However, the parking could be problematic. Hi we're glad you enjoyed your stay in Bridgnorth at Donkey Shed Cottage.We hope you enjoyed the Autumn steam gala at the SVR. We supply a parking permit supplyed by Shropshire council which allows visitors to park in the residents parking area. great location, well equipped, and comfortable ! The cottage is very clean and has everything you need. The small garden has amazing views. Thank you for your review.We are glad you enjoyed Donkey Shed Cottage and hope to see you again in the future. A really lovely cottage. Fantastic location in the heart of Bridgnorth, convenient for all the amenities that Shropshire has to offer. Will definitely be back! Ironbridge world heritage site 15 minute drive.Blist Hill museum 15 minute drive.Bewdley 30 minute drive.West Midland Safari Park 40 minute drive.Severn Valley Steam Railway 10 minute walk.Local taxis available if required.